The right of the majority to rule is not, and never has been an absolute right. From the birth of Greece, about 3500 years ago, it was clearly understood that the majority must rule in the interests of the community as a whole, not merely the majority themselves. To do so was known as the Tyranny of the Majority and was recognised as a fatal anathema to democracy itself. The Greeks also discovered very early in the development of democracy that any elected body, without constraints, could not be relied on to protect liberty and quickly became tyrannical dictators. As democracy evolved restraints on majority ruling groups were developed to ensure elected representatives, at all levels of government, could be held to account, controlled and even dismissed from office by those they represented if the rights of the minorities were denied. Included in these rules were a set of inalienable rights of the individual which are supposed to be beyond the interference of the ruling democracy or even a ruling monarch. Several monarchs lost their crowns and the heads which held them for ignoring that rule. In 1215, rather than risk that fate, King John signed the Magna Carta which included many of those individual rights we now take for granted. In some nations these minority and individual rights are written into a constitution, which bind their governments. In New Zealand, they are listed in the New Zealand Bill of Rights (1990). Only in time of war, declared civil emergency or on conviction of certain crimes, can some of these democratic rights be denied or suspended and then only under strict conditions. 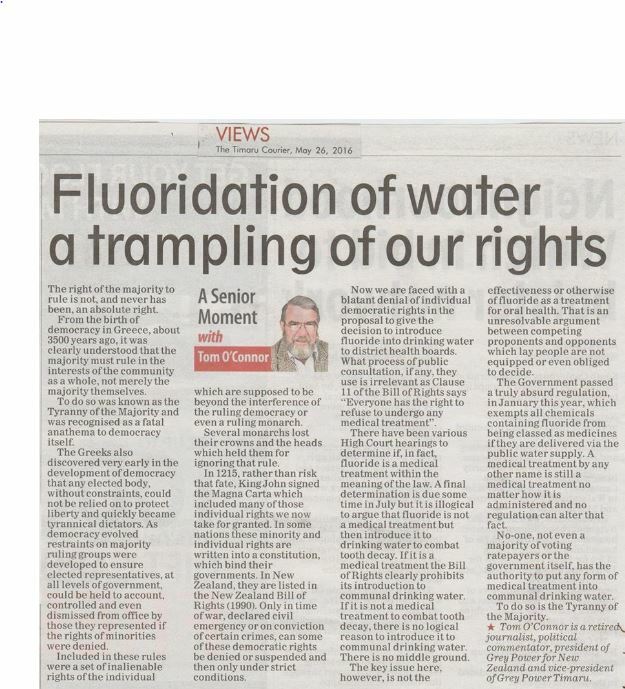 Now we are faced with a blatant denial of individual democratic rights in the proposal to give the decision to introduce fluoride into drinking water to district health boards. What process of public consultation, if any, they use is irrelevant as Clause 11 of the Bill of Rights says “Everyone has the right to refuse to undergo any medical treatment”. There have been various High Court hearings to determine if, in fact, fluoride is a medical treatment within the meaning of the law. 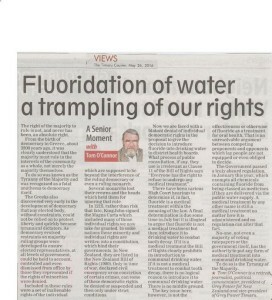 A final determination is due some time in July but it is illogical to argue that fluoride is not a medical treatment but then introduce it to drinking water to combat tooth decay. If it is a medical treatment the Bill of Rights clearly prohibits its introduction to communal drinking water. If it is not a medical treatment to combat tooth decay, there is no logical reason to introduce it to communal drinking water. There is no middle ground. The key issue here, however, is not the effectiveness or otherwise of fluoride as a treatment for oral health. That is an unresolvable argument between competing proponents and opponents which lay people are not equipped or even obliged to decide. The Government passed a truly absurd regulation, in January this year [sic], which exempts all chemicals containing fluoride from being classed as medicines if they are delivered via the public water supply. A medical treatment by any other name is still a medical treatment no matter how it is administered and no regulation can alter that fact. No-one, not even a majority of voting ratepayers or the government itself, has the authority to put any form of medical treatment into communal drinking water. To do so is the Tyranny of the Majority. Tom O’Connor is a retired journalist, political commentator, president of Grey Power for New Zealand and vice president of Grey Power Timaru. Article first appeared in the Timaru Courier, 26 May 2016. Note: Exemption for fluoridation chemicals passed in January 2015 not this year as stated in article. NZ Medical Journal – A case of skeletal fluorosis?